Hosting is a service that runs servers that aid groups and individuals to serve content over the Web. Various types of services are available depending on requirements. After investing in technology platforms and Web solution, you will need a reliable platform to deliver it on. You can’t afford for your site to be down due to technology failures. Nexwrx offers a combined variety of services such as Email & DNS Hosting, Domain Name Registration, Support services, Managed Services, Virtual Private & Dedicated Server Solutions, Implementation and training to guide your business or personal needs. A Web Hosting Service is a type of hosting service that allows individuals and organizations to make their website accessible. 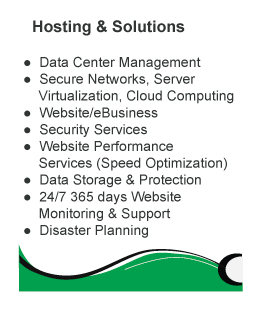 Nexwrx provides owned or leased servers for use by clients, typically in a data center.